Could ISIS bring Russia and the west together? For a couple of years after 9/11, there was a solid US-Russia anti-terrorism cooperation that basically gave the Kremlin a freer hand in crushing the Chechens. The first Chechen war: Grozny. Demoted/Alexander Nemenov. All rights reserved.“The Islamic State (IS) is Russia's main enemy”, the Russian Foreign Minister Serguei Lavrov has recently declared and, indeed, the Kremlin has reasons to be worried about them. Out of an estimated 20,000 foreign recruits fighting in Iraq and Syria in the ranks of IS and other extremist groups, it is believed that 2,200 are Russian nationals. Russia’s main concern is the impact the rise of these jihadist groups may have on its domestic Islamist insurgency. For decades, the North Caucasus region has been prone to political instability and violence, and Russia has waged two wars in Chechnya since the collapse of the Soviet Union. After Russia's last military campaign, which lasted throughout the 2000s, Chechnya has remained relatively calm but the instability spread to the rest of the mountainous region. During this time, Chechnya’s initially secular national liberation movement has been transformed by a militant jihadist movement, strongly influenced by pan-Islamic fundamentalist ideas. Nowadays, jihadist militants such as the self-proclaimed “Caucasus Emirate” in the North Caucasus are seeking to establish a pan-Caucasus state governed under Sharia law. However, the escalation of the conflict in Syria in recent years has shifted the regional insurgency dynamic in Russia. In particular, the exodus of hundreds of fighters from the North Caucasus to Syria to join IS and al-Qaeda’s official local affiliate, the al-Nusra Front, has led to attacks in the North Caucasus falling to the lowest levels in years. Evidence exists that fighters of North Caucasian origin were present in Syria since 2012. They decided to embark on armed jihad in Syria and gain valuable battlefield experience which may ultimately have repercussions on the struggle in the Caucasus on their return. At the beginning, all North Caucasian jihadists began their fight as part of the same group, Jaish al-Muhajireen wal-Ansar, closely linked to the al-Nusra Front (the al-Qaeda branch in the area) and led by Omar al-Shishani, an ethnic Chechen originally from the Pankisi Gorge (Georgia). Now, they are scattered in several groups: ISIS, the Caucasus Emirate in Syria, and Junud al Sham, among others. In their efforts to recruit fighters from Russia, ISIS has recently launched a Russian-language magazine, Istok, and created a new Russian-language propaganda channel, Furat Media. In fact Russian is the third most used language by ISIS in its propaganda material, after Arabic and English. Some sources indicate that this exodus of jihadist fighters from the Caucasus to the Middle East may be actively supported by the Russian secret services (FSB). It is claimed that they have been providing the necessary foreign passports to travel there, establishing a so-called “green corridor”. In an article published recently in Novaya Gazeta, the mayor of a village in Dagestan explained the following: “In our village there’s a person, a negotiator, who, together with the FSB, has brought several commanders of the Caucasus Emirate out of the underground and has sent them abroad to join the jihad. The insurgency here has been weakened, and that’s a good thing. If they want to fight, let them fight, but not here”. Similar claims were made by Abas Makhmudov, a former member of the Islamic Council of Chechnya and Dagestan, whose son was recently killed in Syria fighting for the jihad: “What baffles Mr Makhmudov is how his son, who had a criminal record, obtained the Russian passport needed to travel abroad—even after he alerted the authorities to his son’s intentions”, he told The Economist. Moreover, some notorious Islamic preachers from the region have also travelled to Syria, encouraging their followers to join extremist groups in the Middle East. One of them, Nadir Abu Khalid, was under house arrest in Dagestan when he suddenly popped up in the Middle East pledging allegiance to ISIS. This strategy to throw off potential terrorists out of a home country and direct them towards another conflict zone is not a new strategy. According to a CIA operative who had worked in Central Asia, this is a counterterrorist tactic that Saudi Arabia itself had used against the USSR: “It’s perfectly conceivable that the FSB would take their most violent types and say, ‘Yeah, you want your caliphate? Go set it up in Raqqa.’ The Saudis did this in the ’80s with the Afghans. It’s sort of tried and true». Last, but by no means least, the organisational structure and hierarchy of the Caucasus Emirate has also been substantially altered by the impact of Islamic State. In 2014 some of its mid-level commanders began to defect to ISIS, a trend that escalated until June of this year, when the emirs of the four main Vilayats (provinces) that make up the Caucasus Emirate pledged allegiance to ISIS leader al-Baghdadi. He accepted these pledges and appointed a local militant, Abu Muhammad al-Qadri, as Emir of the Caucasus, as well as establishing a new Vilayat of the Islamic State in the Caucasus (Vilayat Kavkaz). Since then, the Caucasus Emirate has been restructured and continues to exist although it has been greatly weakened. Its members coexist with the Caucasian branch of Islamic State, as competing forces, in the mountains of the North Caucasus. 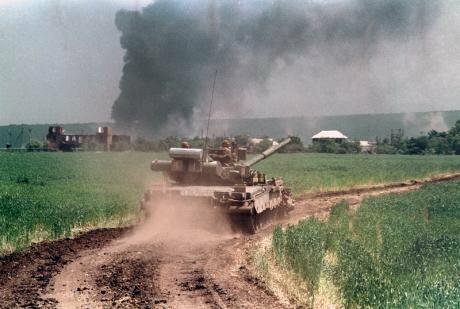 Given this scenario, and as occurred during the Chechen wars, Russian politicians and media outlets are underlining the fact that the Islamist insurgency in the North Caucasus is instigated by a global, external force. Depicting the domestic insurgency as exclusively international terrorists worked well before. For a couple of years after 9/11, there was a solid US-Russia anti-terrorism cooperation that basically gave the Kremlin a freer hand in crushing the Chechens. In exchange, Moscow worked with the west in forcing aside the Taliban from power in Afghanistan. And now, with Moscow stressing that ISIS is Russia’s main enemy, and taking into account that the ISIS has a branch in Russian territory, the Kremlin wants to create an image of Russia as one of the main legitimate forces to lead an international coalition to fight against ISIS. Russian President Vladimir Putin will be in New York, at the United Nations General Assembly, at the end of September, and possibly Syria may be one of the main topics to discuss. Mr. Putin might propose a new format for a broad anti-ISIS coalition in which Russia would have a central role and Assad would be included. “We really want to form some kind of an international coalition, therefore we conduct consultations with our US partners,” Putin said, noting that he spoke about it with President Obama. In order to push the west towards this direction, some evidence shows that now the Kremlin is sending some of its most modern weapons to Tartus, Russia's base in Syria, in order to have a significant military foothold in the region to back up Assad's regime and fight ISIS. In this context, if a new dialogue between Russia and the US takes place, that could ultimately reset the relations between the west and Russia, which is, possibly, an objective the Kremlin would like to pursue. In this respect, as Joanna Paraschuk pointed out in her blog, it is worth examining how Rossiskaya Gazeta, one of the Kremlin’s newspapers, described a meeting between the head of FSB, Aleksandr Bortnikov, with members of 64 countries to discuss the fight against terrorism: "None of the European and American colleagues recalled the sanctions against Moscow at the meeting. They all understand that the war against global terrorism without Russian participation in principle is impossible."